Michelle Acton, part time clerk, staff member since October 2005, is getting married and moving out of the area. She was a valuable employee and will be missed by patrons and staff alike. We wish her luck in her future endeavors. Joining us as new staff are Jennifer Nail, Malea Vanlaningham, and Kaitlyn Arford. Jennifer is working as a part time clerk in our adult department this summer. She has a background in computer technology and we hope to complete several projects using her technological skills. Kaitlyn is a 2012 Wawasee graduate. She is working as a summer part time clerk in the children’s department. Kaitlyn’s youthful enthusiasm will be a great asset working with the children this summer. Malea Vanlaningham is our new permanent part time page. She is a college student and former volunteer at the library. Malea will work several hours a week, returning materials to their proper place on the shelves. We welcome these ladies to our staff. 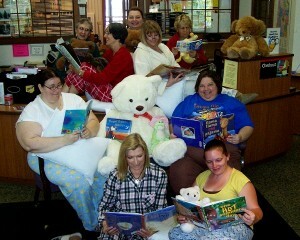 The Milford Public Library staff is “Reading Up” for the library’s 2012 Summer Reading Clubs. Pictured : Back row: Sharon Fouts, Julie Frew and Dorothy Haney. Middle row: Mim Eberly and Tina Meerzo. In Chairs: Jennifer Nail, Teddy (Library’s mascot), and Shari Lambert. On the floor: Maureen Haab and Heather Pickens. Kids, come in and sign up for the Summer Reading Program beginning June 4. The more you read, the more prizes you earn! Read five hours and you will receive a ticket to the annual grand finale picnic on August 1 at Lake Waubee. Teens, sign up for the Summer Reading Club at the adult desk. Prizes are awarded every five hours read. Teens are invited to learn the “Thriller” dance by attending practices every Thursday at 2:00 p.m., beginning June 14. We plan to make a video of our teens dancing to “Thriller” and post it on the library’s website. Dream Big, READ, for ages infant through 5th grade, and Own the Night, for grades 6 through graduating seniors, are this year’s themes. Come join the fun! Troy Roark, Master Entertainer, will kick off summer events with the “Glow in the Dark Show,” using black light and UV technology to deliver a show that will truly amaze! Catch this free performance at the Milford Community Building on June 13 at 2:00 p.m. No tickets or sign up is needed. This show is open to the community. All ages are sure to enjoy Mr. Roark’s program. Want to learn to knit? Come to the Evening Knitting Club on June 14 from 6:00 p.m. to 8:00 p.m. in the library meeting room. Preschool Story Time continues in the summer months. The library offers two weekly sessions, one on Thursdays at 7:00 p.m. and a second on Fridays at 11:00 a.m. Our summer preschool story time will begin on Thursday, June 14, at 7:00 p.m. with Miss Tina reading stories about fantasy animals. Our first guest storyteller is Peggy Miller, who will read stories on Friday, June 15, at 11 a.m. Miss Peggy will also read stories about fantasy animals. Summer Preschool Story Time will continue for six weeks and last approximately 45 minutes. Sign up for story time begins June 6 at the children’s desk. This is a great opportunity for your children to meet new friends, improve listening skills and develop a life-long love of books. Don’t forget to call Dial-a-story at 574-658-9540.